This is the definitive DVD biography of the saint from Pietrelcina, Italy. this DVD introduces the faithful to every aspect of the life, spirituality, and work of this 20th century saint. 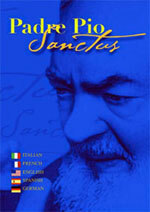 Padre Pio Sanctus features five language tracks  Italian, French, English, Spanish and German. Running time 30 min, approx.